Click the button below to add the Daiwa RG Spinning Reels to your wish list. 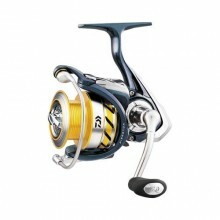 Daiwa RG Spinning Reels are expertly constructed with lightweight components and amazing features. These reels are extremely lightweight, yet powerful, with high-quality components including a double-anodized aluminum spool, aluminum handle, Air Rotor, and a stainless steel Air Bail. Digigear digital gear design and infinite anti-reverse also contribute to the unparalleled smoothness, power, and performance these reels generate.